This book delves into a question that has become increasingly prevalent over the past decade: Who shapes our cities? For over a century the answer to this question included a range of usual suspects, dependent on the global context. In the Modern era of the Global North, cities were usually shaped by governments, giving way over the decades to powerful private interests. The inflexibility of this order has prompted some of the most influential urban theorists of the twentieth century such as Jane Jacobs, Jan Gehl, and William Whyte to reappreciate individual agency in the Modern city, and Kevin Lynch to argue for a more democratic urban environment in which citizens can achieve a better ‘fit’ for their needs (Gehl 1987; Jacobs 1961; Lynch 1984; Whyte 1988). In the Global South cities have been shaped by a far more complex interplay of governmental and non-governmental organizations, politicians, and citizens. Conversely to the perhaps overly ordered environment of Western cities, informal cities in developing countries have often struggled to maintain a physical, social, and economic infrastructure for their populations, prompting concern among global organizations such as the United Nations and the World Health Organization. The status quo between Northern rigidity and Southern informality has increasingly been uprooted from the bottom up, shaking up global distinctions. 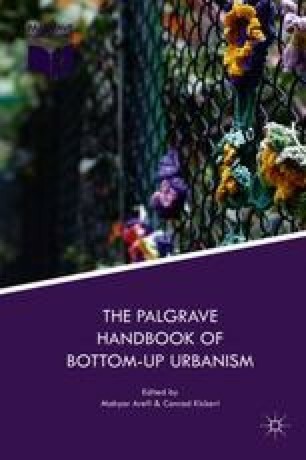 This book explores the various new ways in which our urban environment is transformed by new stakeholders, challenging the public–private hegemony in Western countries, while bolstering a new urban order in the Global South.